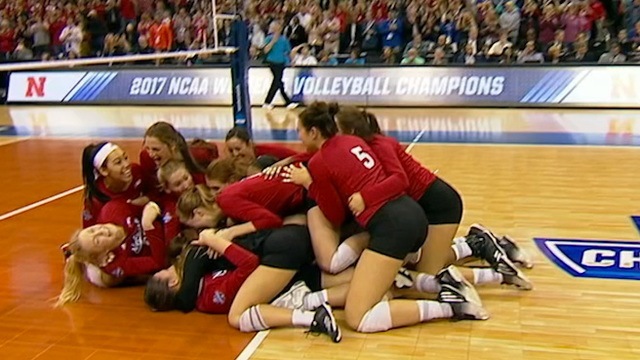 Nebraska wins the 2017 DI women's volleyball championship. The 2018 NCAA Division I women’s volleyball season begins Friday and several top teams aren’t shying away from a challenge on opening weekend. In total, there are 10 ranked matchups, with three of the top seven teams playing at the site of reigning national champion Nebraska. What better way to start off the 2018 season than with a rematch of last year’s national championship match at one of the best home courts in college volleyball. Seeking a fourth straight final four appearance, Nebraska returns player of the year candidate outside hitter Mikaela Foecke and added outside Lexi Sun, who was a first-team all-Big 12 selection at Texas last season, as well as top setter in the 2018 class Nicklin Hames. Florida graduated four All-Americans but added Gatorade national player of the year Thayer Hall and a 6-foot-6 freshman middle blocker in Lauren Dooley. Florida’s opening weekend includes not only the second-ranked team in the country, but also the third-ranked team in Texas. The Longhorns are coming off a second straight season losing to Stanford in straight sets in the NCAA tournament, this time in the regional final. Coach Jerritt Elliott has to replace hitters Ebony Nwanebu, Big 12 player of the year Chiaka Ogbogu and Sun, but still has player of the year candidate Micaya White entering her junior year. Conference preseason freshman of the year Logan Eggleston and 2017’s second-ranked player Brionne Butler are both ready for their debuts this season. The Wildcats and Trojans are in completely different spots at the beginning of the year, but each have the same aspirations. After a 29-4 season in 2017, Kentucky returns last year’s SEC freshman of the year in setter Madison Lilley and first-team All-American junior outside hitter Leah Edmond who could be a player of the year candidate. First-year head coach Brent Crouch inherits a team that lost in five sets in the regional final to Florida last year and lost four of its top six hitters. Junior outside hitter Khalia Lanier returns after a first-team All-American season. Before the Wildcats square off against the Women of Troy, the Creighton Bluejays get their shot at the reigning SEC co-champs. Creighton finished 26-7 last year with a Big East championship, eventually losing in the second round of the NCAA tournament to Michigan State. First-team all-Big East selections junior Jaali Winters and sophomore Britney Witt return at outside hitter and libero, but the Bluejays do have to replace first-team all-conference setter Lydia Dimke. Creighton beat Kentucky last year in straight sets. Northern Iowa might be the only unranked team on the court this weekend at Southern California, but the Panthers are undoubtedly one of the best mid-major programs of the past decade. UNI was picked as the preseason favorite in the Missouri Valley with hitters Piper Thomas and Karlie Taylor returning after each posted more than 500 kills last year. All three of the teams in Los Angeles will play each other over the weekend. The final game of the weekend at Baylor features two teams who have high expectations after reaching the NCAA tournament and returning a majority of their core players. Baylor junior Shelly Fanning and sophomores Yosianna Pressley and Hannah Lockin are preseason first-team all-Big 12. For the Golden Eagles, Big East player of the year Allie Barber is back for coach Ryan Theis on the outside as well as last year’s conference freshman of the year Hope Werch. This game will be a healthy barometer for two teams looking to make a big stride this season. Baylor comes storming back from a 2-0 deficit to win the match over Denver in five sets. Washington is hoping to reassert itself in the Pac-12 after finishing 14-6 and five games behind champion Stanford with junior outside hitter Kara Bajema returning. They were picked to finish sixth in the preseason conference poll. San Diego returns three of its top four hitters, but did lose conference player of the year Kristen Gengenbacher. Senior middles Kaity Edwards and Addie Picha are the players to watch. Both teams lost in the second round in 2017. This game features two of the best setters in the entire country with Fighting Illini senior Jordyn Poulter and Rams junior Katie Oleksak, the reigning Mountain West player of the year. Illinois also has all-conference middle Ali Bastianelli. Colorado State is a team without a senior, but returns a solid core of a team that made the second round of the NCAA tournament, which includes last year’s conference newcomer of the year and team leader in kills, Breana Runnels. Joining the Longhorns, Florida and host Nebraska in Lincoln on opening weekend is the Oregon Ducks who could be a sleeper final four contender. After losing in the second round of the NCAA tournament to BYU last season, second-year coach Matt Ulmer has three of his top four hitters returning in juniors Ronika Stone and Willow Johnson and senior Lindsey Vander Weide. Oregon will play No. 2 Nebraska the following day. From the site of the 2018 final four, Florida State and North Carolina will each play No. 4 Minnesota and No. 9 Wisconsin. However, this is the game to highlight out of that group in the first weekend because the national freshman of the year is back for a second season with the Badgers. Dana Rettke, the 6-foot-8 middle phenom, Tionna Williams and Molly Haggerty are the main reasons why Kelly Sheffield’s team is a potential final four team. After a ninth straight NCAA tournament bid, Chris Poole’s Seminoles are led by sophomore Taryn Knuth and junior Payton Caffrey, an all-Big 12 transfer from West Virginia. The matchup won’t jump off the page as two of the sports blue bloods, but both teams made the second round of the NCAA tournament in 2017 and are picked to win their conference again. Cal Poly lost three senior who were all-Big West first-team members, but it has four players on its roster that earned Big West postseason honors last year, including junior Torrey Van Winden who ranked sixth in the nation in kills per set. Pittsburgh, however, returns all five 2017 all-conference selections. Senior setter Kamalani Akeo leads the Panthers with Nika Markovic and Stephanie Williams on the pins.